The other day I had an opportunity to have a one-on-one with a makeup artist. Although this may sound rather shallow or as Savvy Sis and I call it, "deep as puddle", right makeup can sure make a lot of difference. If a face is compared to a painting, then properly styled eyebrow is the frame that complements the canvas. Prior, I styled and filled in according to what I perceived pleasant looking. 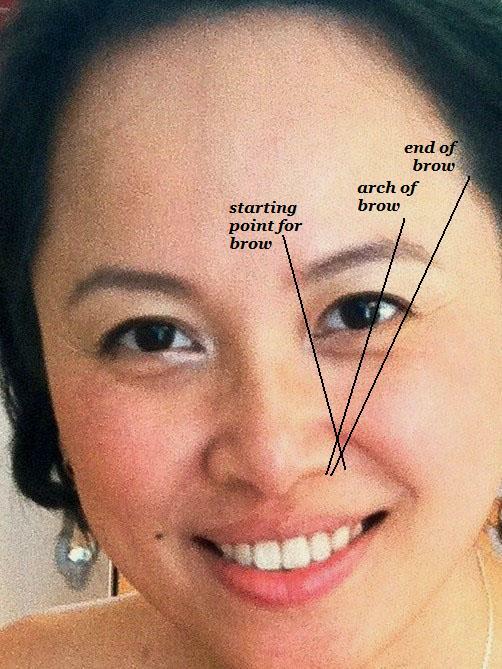 However, I am happy to learn there is a general formula to art of brow. I had lots of fun learning about my own eyebrow and how to shape to a more balanced face. These are the general rule but every gal's face will differ so adjust these rules to fit your need and have fun! On the side note, I am pretty excited Anastasia Beverly Hills is sending me an eyebrow kit to test. Anastasia has long been the eye and brow expert for celebs such as Madonna, Jennifer Lopez, Oprah as well as up-and-comers like Diana Agron, Selena Gomez and Kristen Cavalari. I can't wait to try the beauty set so I can have stylish eyebrow like these gals. While I am waiting, I thought everyone will enjoy this short video about shaping the perfect brow. Hey! Thanks for stopping by my blog & your lovely comment - hope to see you again soon! Great how to! I always shape my own brows, wouldn't let anyone else touch them!!!! Great tips! I don't really shape my brows, just pluck the strays. I must say.. My eyebrows are perfection. Supposedly, according to my gay coworker, my brows have the perfect arch. So I guess I've mastered this! Oh, that's really great! But I always leave the job to professionals! Funny, I also stumbled upon a blog a few days ago featuring similar tips to reshape one's eyebrows! Great tips, nonetheless! i love the anastasia brow kit! you'll love it! Great tips and the picture makes it so much easier! Hope you like the eyebrow kit! Sigh ... I overplucked as a teen despite my mother's warning and my eyebrows have never recovered (just as she warned).